Apple has officially announced the details and features of new iPad 2. Today, Apple's CEO Steve Jobs set the stage to announce the next version of the iPad, the iPad 2. Steve Jobs has also announced some updates about iBooks, with over 200 million registered accounts and $200 million dollars paid out to publishers. Apple announced that they have sold 15 million iPads in 2010, in only nine months since its launch. Steve Jobs unveiled the new iPad 2. The updated device will come with an A5 dual-core processor, with 2x faster CPU, 9x faster GPU, which offers the same low-power benefit as the A4 processor. The iPad 2 features a front and rear-facing camera, so you'll be able to FaceTime with other iPad, iPhone or iPod touch users. The new iPad 2 is thinner than the original iPad, at just 8.8mm thick, thinner than the iPhone 4. The second generation iPad weighs in at 1.3 pounds, slightly lighter than the original. It will be available on both AT&T and Verizon, and in both black and white, with no shipping delays, unlike the iPhone 4. Apple reports the iPad will have a 10 hour battery life, with up to a month of standby time. Pricing will be the same as the original, with the same WiFi-only and WiFi+3G models in 16GB, 32GB and 64GB. Pricing starts at $499 for the 16GB WiFi model and $629 for the 3G 16GB model. 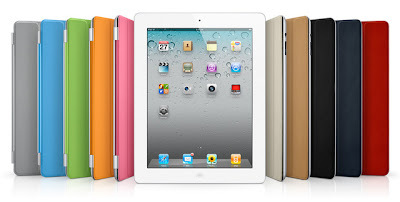 The new Apple iPad 2 will ship on March 11 in the United States, Canada, France, Germany, Japan and UK, and March 25 in 26 more countries. There will also be an accessory cable that delivers HDMI mirrored video output (1080p). The accessory cable will allow you to charge your iPad while you use it. The new cover will also feature a magnet which can lock your iPad when you close it and wakes when you open it. FaceTime for the iPad will now allow you to transfer video between an iPod touch (4th generation), iPhone 4, and supported Macs. FaceTime will soon allow HD video (up to 720p) for streaming live video. iMovie will soon come with a massive update for the iPad 2, with a precision editor, multitrack audio editor, new interface and many more exciting features.